Garden edging is important because you need to keep turf grass and lawn weeds such as clover or creeping-charlie from getting into your flower beds. 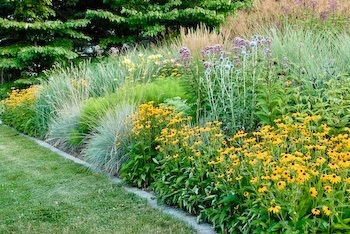 If you’ve ever had lawn grass invade a planting bed, you know what a nuisance it can be to weed out of clumps of perennials.It’s also problematic if ground cover or other plants start to creep into your lawn. Preventing this from happening is the key to sharp-looking boundaries between your lawn and your garden. Good edges define the lawn’s border and help your flower beds look neat and cared for. Here are several edging choices along with advantages and disadvantages you can expect in terms of effort and cost. Simple trench: Use a square-edged spade or half moon edger to dig a trench about 4 to 6 inches wide and 6 inches deep to cut a border between your lawn and planting beds. The lawn edge should be cut straight down, with the border edge tapering at a 45 degree angle. This method of edging (also called Victorian edging) is inexpensive, but requires effort and needs to be redone at least once or twice year. This job can also be done with a machine border edger, and would need to be recut more frequently, but that’s easy when running a machine along the border. Metal: Metal edging is more expensive than plastic, but it lasts longer and is easy to install. You can buy this edging in eight- or 16-foot lengths that you join up with special clips. Metal edging comes painted – usually brown or green – or unpainted. The painted versions look less obtrusive than the unpainted silvery gray. Grass can still creep in at joins between two pieces of metal, so those spots have to be hand edged or weeded occasionally. Flagstone or concrete pavers: These materials work well as garden edging and should be set into the ground flush with the lawn and be at least 6 inches wide, so you can run your lawn mower along the edge. Edging with cut stone or concrete pavers is more expensive and attractive than plastic edging, but more durable. These materials need a base of gravel to sit on, and pavers need an edge restraint so they don’t shift or get heaved up with freeze-thaw cycles. Unfortunately, weeds and grass can eventually grow through, which means you should periodically go around the border with a half moon edger, or crack weeder . Plastic edging: This type of garden edging is widely available, but too often looks cheap and ugly because it’s not installed properly. If you choose black plastic edging, buy the more expensive, heavier gauge commercial type. The edging material should be at least five-and-half inches wide. Install plastic edging so that only a half or third of the top rounded edge is visible. This way, instead of resembling a hose that you left out, it looks unobtrusive, and you’re less likely to nick it with your lawn mower. Here’s a good resource on how to install plastic edging (link opens a new window).